Este mes de octubre sale publicado en la revista americana Journal of Educational Computing Research el último artículo derivado de mi tesis: “ETeach3D: Designing a 3D Virtual Environment for Evaluating the Digital Competence of Preservice Teachers“. Se trata de una descripción detallada del proceso de diseño, desarrollo y validación de un entorno 3D, mediante la metodología de investigación Educational Design Research (EDR), variante del conocido sistema DBR. The acquisition of teacher digital competence is a key aspect in the initial training of teachers. However, most existing evaluation instruments do not provide sufficient evidence of this teaching competence. 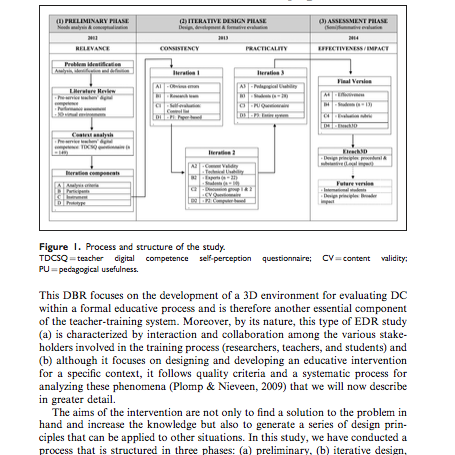 In this study, we describe the design and development process of a three-dimensional (3D) virtual environment for evaluating the teacher digital competence of future teachers, through a performance-based, collaborative and contextual evaluation. 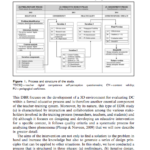 This environment, named ETeach3D, has been constructed using the educational design research approach. It is based on successive iterative cycles and is in accordance with the criteria of usefulness, validity, and effectiveness. In addition to the research team responsible for the project, participating in this study were 187 Spanish undergraduate students of Education and 22 experts in the field of educational technology. Results show that these environments, in addition to other characteristics, should (a) function smoothly and have simple interfaces, realistic scenes, and interactive activities and (b) follow a systematic evaluation procedure that integrates several strategies and levels of complexity. This research helps to improve the initial training of preservice teachers and contributes to the growing number of educational design research studies that focus in the field of evaluation of the curriculum domain.